Description: The wagon plays are free - the audience stands in the street around the wagons or sits on the ground. Recent productions by the Guilds have organised a covered stand in some locations, where a seat-ticket can be bought. From 1951 productions in Museum Gardens charged different amounts for the seats depending on location. In 1951 ticket prices ranged from 2/6 (two shillings and six pence - an eighth of £1) to 10/6 (ten shillings and six pence, just over half £1). In 1957 we have comparative prices for a production of the Chester Mystery Plays: Ticket prices were 10 shillings (50 new pence), 7 shillings and 6d, 5 shillings, and 3 shillings and 6d . In 1960 tickets for the Mystery Plays cost from 20 shillings (£1), 15 shillings, 10 shillings, 7 shillings and 6d. In 1966 tickets cost 25 shillings, 20 shillings, 15 shillings, 12 shillings and 6d, or 7 shillings and 6d. In 1969 we have other information in a scrapbook. Mystery Play tickets were 25 shillings, 20 shillings (£1), 15 shillings, 12 shillings 6d, 7 shillings 6d. For the concurrent York Festival, Theatre Royal tickets ranged up to 42 shillings for the Marriage of Figaro and Ballet from the Netherlands Dance Theatre (£2.2s). In the Minster tickets for the Berlioz Centenary and for the Hallé Orchestra were from 60 shillings (£3) to 10 shillings (50 new pence), or 50 shillings (£2 10s) to 10 shillings for the London Symphony Orchestra. 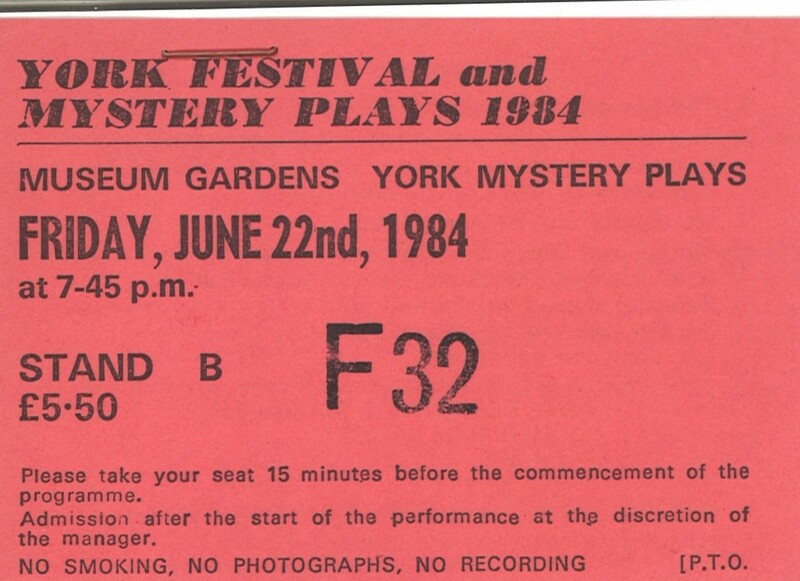 In 1976 Mystery Play tickets cost from £2.30 to £1. In 1980 tickets cost £3.50, £3.00 or £2.50. In 1984 seat F32, Stand B on Friday 22 June cost £5.50 (ticket donated by Prof Margaret Rogerson, the oldest ticket in the archive). That was the same price as a Minster Central Nave ticket in the Festival to see the Academy of St Martin in the Fields. In 1988 the plays cost £8.50, £7.50 and £6.50. By comparison the Wakefield Mysteries performed at Pontefract Castle cost £4.50 for one part or £7.50 for both parts. In 1992 (in York Theatre Royal) tickets cost from £13 down to £6, with all matinee seats at £6. In 1994 a selection of three plays was performed in the garden of the Treasurer's House (owned by the National Trust, near York Minster): tickets cost £5. In 2000 (the Minster Millennium production) tickets ranged from £21 to £7. Tickets for the 2016 York Minster Mystery Plays were £40, £32.50, £25 (evening); matinee tickets from £15 for children, and £25 - £40 for adults. There is a currency converter hosted by the National Archives which converts prices to 2017 amounts. Click here.